Welcome back, Jackie Chan. Though it’s been a long time since we’ve seen a true, balls-to-the-wall Jackie Chan film, a new teaser for his latest, Chinese Zodiac (also known as CZ12 or Armour of God III: Chinese Zodiac in some countries), has Chan back at his best and taking down the baddies in what might just be his most amazing stunt sequence ever. Check it out below. In Chinese Zodiac, a treasure hunter named Asian Hawk searches the world for a set of mystic artifacts – 12 bronze heads of the animals from the Chinese zodiac. It’s the third film in Chan’s popular Armour of God series (think Hong Kong’s answer to Indiana Jones), following 1986’s Armour of God (which infamously left Chan with a plastic plug filling a permanent hole in his head and slight hearing loss in one ear) and 1991’s Armour of God II: Operation Condor. Even that Operation Condor came out before Armour of God in the U.S., viewers can probably survive without seeing the first two. It’ll also be Chan’s 100th milestone film and his first film in the director’s seat since 1998’s Who Am I?. Though the teaser doesn’t focus too strongly on plot, it is one of the best things I’ve seen out of Chan in a long time. Over the last decade, the Chinese action superstar has unfortunately been loaded down with film after film that has lacked the personality and charm that made him so fantastic in the first place. It’s great to see him returning to a franchise that made him so popular in Asia and will hopefully get some huge buzz in the states. Asian Hawk (Chan’s Armour of God character) is nothing but awesome and let’s face it: what a return to form for Jackie Chan. Though I never expected to see him in a rollerblade suit, the teaser is funny, physical, action-packed, incredibly dangerous-looking and just all-around Chan. From Drunken Master to Shanghai Noon, from Police Story to Rush Hour, Chan has always been about mixing action with personality and high risk with humor. Some of his best work has come from his involvement not just in front but also behind the camera and considering that the 58-year-old has spent the last seven years writing, producing, action-choreographing, and directing this third film, it already looks like this is going to be a winner. We know that from his presentation at Comic-Con (where he showcased an older trailer and gave a demonstration of the rollerblade suit with a stuntman) that some of the wider shots are probably a stuntman rather than Chan, but still, this is some of the best recent action choreography. Given how huge an impact the Armour of God series has had on his career (at least in Asia), it makes sense that he would try to outdo himself as much as possible with what he says will be his last hurrah in the big action film market due to his age, safety, and family concerns. Though it’ll be sad to see him leave the leading-man action life behind, my props to him for going all-out, vintage Chan-style. 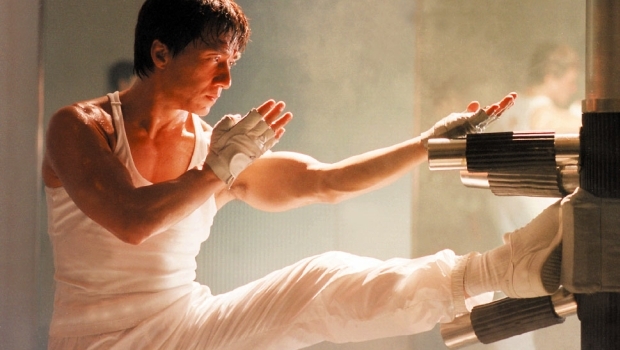 Are you excited to see Jackie Chan’s possibly last action film?